Friday Barnes is the youngest of five children. She’s not a happy child and she tries very hard not to be noticed by anyone. Her parents are very systematic and an unexpected child nine years after their youngest of four planned children was entering high school, was not in on their agenda. However, they discovered they could just manage to fit in a birth, after a PowerPoint presentation her mother gave when her waters broke. Then her parents and family continued to live their lives as though Friday did not exist. By the time Friday was eleven she was so good at being unnoticed by everyone that she discovered she had a problem. She was going to have to go to high school. Friday was cleaver and well read. She loved to read everything, particularly detective stories. Her Uncle Bernie was the only relative she knew who she could ask for advice. He was an ex-policeman who babysat her once a week and turned on the reality TV for her to watch when he was there. He was an insurance investigator and he had a problem with a case he couldn’t solve. Friday had tried various ways to get out of going to high school so when her uncle shared his problem she offered to solve it to gain the $50,000 reward. Now you would think being awarded $50,000 for solving a baffling crime would be a blessing for Friday. She decided to spend the money enrolling in the most expensive boarding school in the whole country. Her motives were practical. The school was based on profit-making and she would be able to bribe the PE teachers so she would never be forced to run a cross-country again. As you can tell Friday was socially inept because she’d kept herself so distant from everyone to remain unnoticed. This created a new problem for Friday. She’d never been nervous about starting school before, and she’d never had to conform to wearing a uniform. Her brown cardigan was usually a way of ensuring she was ignored. At this school, she realised it made her stand out. I won’t go on with the rest of the plot except to say that it’s full of hilarious situations. I chortled through the whole book. I was thoroughly impressed by R A Spratt when I saw her deliver a constant stream of engaging chatter to a group of students at Somerset Literary Festival. Rachel Spratt is bold, loud and over the top. This is the start of a series by this comedy writer. I could hear the author’s voice in every sentence and will happily recommend this book to any adventurous young adult. I love the cover of this book, that’s why I bought it. The story is as surprising as The Marvelous Boy and the heroine Ophelia. She is small for her age, constantly asking questions and looking at everything from a scientific viewpoint. That hardly works when she makes friends with the boy sent by Wizards to save the world. Everything he tells her about the Snow Queen and magic is unbelievable. 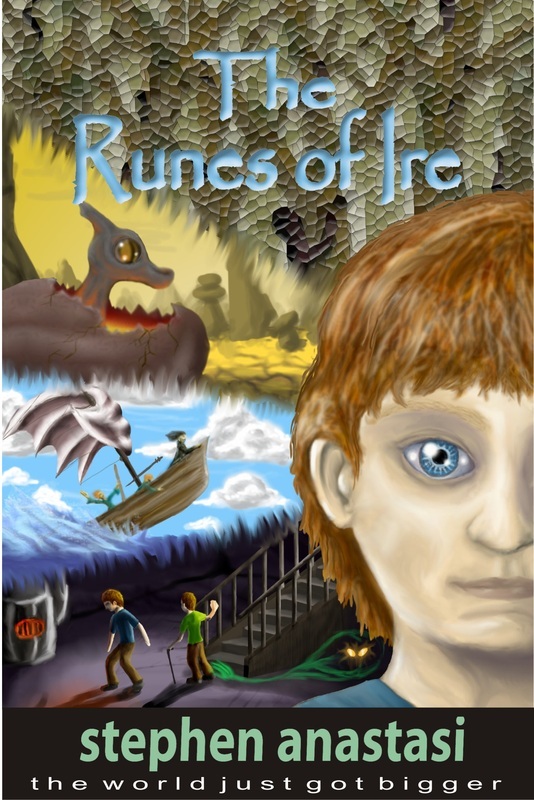 She confronts her fears and collects the keys while searching for the boy’s magical sword. I particularly loved that she didn’t believe in ghosts and is still grieving the loss of her mother when her mother is there, at her shoulder and in her ear, helping her along the way. In a modern world of machines and facts, this is a delightful step into a possible other-world, all very cold and miserable that could be overcome by The Snow Queen. The museum her father works in has very strange exhibits, many who were in fact, the Snow Queens army. The ending is fitting and a true love conquers all scenario! This is the first book I bought at Somerset Celebration of Literature 2017! My granddaughters are mad on horses. Not having had anything to do with horses myself, I have to say it appears to me that horses are a lot of work, and each one has a different personality just as their riders do. I loved this story about Poppy the twelve-year-old who was visiting her Aunt Sophie and Uncle Mark, who run Starlight Stables. Having had a very difficult year with her mum and brother having to move away with the tragedy of losing her father, her trip is to help her be a kid and just go riding. Poppy gets the best present she could wish for, her own horse Crystal a Welsh/Arab. The surprises don’t stop there, they introduce her to two new girls who will be working and riding with her helping clean the stables. Millie and Katie quickly become best friends and like Poppy, they have been given the opportunity to have their own horses at the stables to trail ride whenever they want to, in exchange for work and help around the stables. Milly gets to ride Joe who is three-quarters Arab with a mischievous nature, which Poppy discovers suits his rider. Then Katie gets Cody a palomino. The riding lessons commence immediately and the girls learn a lot from dressage riding champion Sophie. When the girls hear about horses being stolen in the area they decide to find them. That’s when the trouble begins. If they go to investigate they may lose all their privileges and be sent back home. They may even have their horses taken away. The three headstrong girls set out to find the missing horses. I enjoyed the easy flowing style of Soraya’s writing showing the details of riding, sitting in the saddle and different types of events to train for while pushing the story forward. My G rand-daughter picked it out of literally hundreds of books on offer at her school library for Book Week on Grandparents day. This is a beautiful picture book with illustrations that show the story simply, while the words in big print make it easy to follow. James and his Dad are visiting Alec Campbell in Tasmania. 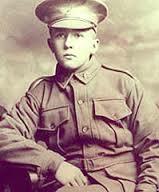 Alec is the last Anzac in 2001, and he was 102. The historical advice from the Australian War Memorial along with the illustrations showing the reality of the journey Alec made at 16 to join the war effort in 1915. The best part is that James asked Alec questions about the war and Alec answered. I am certain this will join our reading time stories that are re-read many times. Having just marched in the ANZAC parade for the School, my Grand-daughter clearly picked up on the importance of the event. This is a great collaborative collection of short stories, poems and a novella for children aged 8 to 12 to enjoy. Bought out by the The Ten Penners whose original book ‘Shock, Horror, Gasp’ was released in 2004. This edition came out in 2009. ‘Petal’ the dragon makes Hannah Elizabeth’s life much more interesting when he arrives in her life straight out of her picture book in ‘Petal the Hungry Dragon’. They share many other adventures in ‘Petal Goes to the Snow’, ‘Petal Goes to School’, ‘Petal gets Dumped!’ and ‘Petal and the Easter Bunny’. These stories are full of hilarity by the humble and happy Jill Ford. ‘Grandma J’ proves that being old is an advantage to being a sleuth, no one really notices you. This great novella by Yvette Coutts scattered with her original sketches. 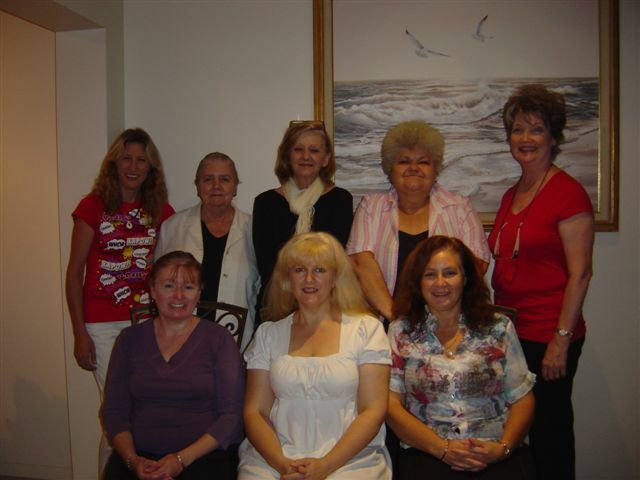 ‘The Big Squeeze’ gets into the world of cheerleaders and their friendships, planning and creative ways of fundraising. 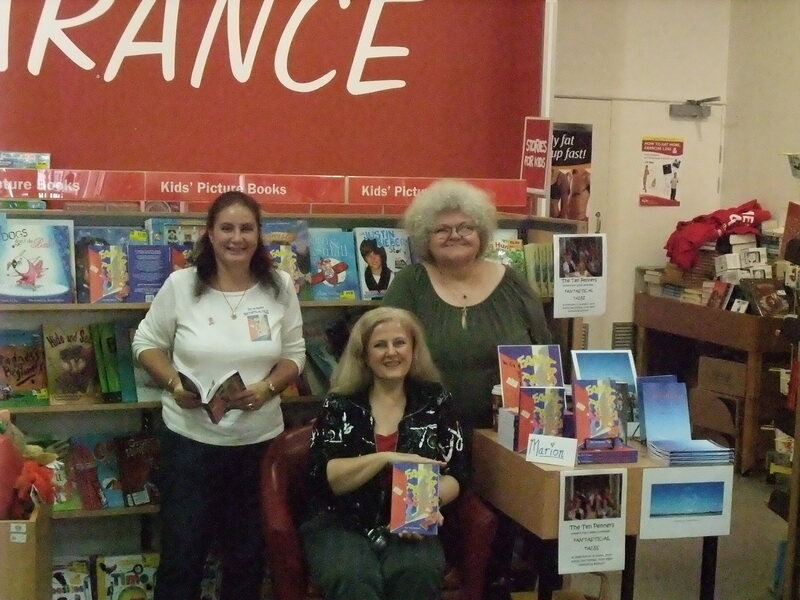 Lorraine Blomberg wrote this great story, as well as painting the cover design for the book. She also added a brilliant poem Tree of Trolls, which she also illustrated. ‘Scared to Life’, a journey through a fun park that was not so funny and very scary for a young brother and sister. ‘The Enchanted Dolls House’ is a delightful story of a very special gift, and ‘Mrs Mulligrubs Investigates’ a poem, all by Maria O’Donnell. Several stories by Lindy Standage include ‘Aliens In the Park’, ‘The Night Before Christmas’, ‘A tale’, ‘Halloween trip’, ‘More Adventuring’ and ‘Hope’. You may never look at hairy spiders the same way after reading Efangs tale. ‘Wart Boy!’, ‘Snot Cream Pie’ and ‘Spook Sleuths II’ are stories from the group co-ordinators Marion Martineer’s pen. Being a bully can have some sweet tasting consequences. ‘Black Cats Bullies and Boils’ a novella, Kylie has just turned 12 and instead being an ordinary girl she finds out she’s a witch. ‘Zelda the Witch’ is a poem, and ‘The Princess and the Tramp’ is a fairy tale with a twist, all by the enchanting Kate Pepper (now Russell). Then there are contributions by my own hand, ‘Magical Musical Mervin’, ‘Horrible Hilda’ who had one big rainy day to get through, ‘The Toothpaste King’ how can young TC help his father the King? ‘The Night Witch’ would Jayne and Matthew escape Dreamland? ‘Goblins in the Grounds’ Bree is having a real bad day at school, when she bumps into a boy called Eric, it gets worse. Feedback by children who have read this book is very positive, with children of many ages from 6 to 12 reading and enjoying these stories. This is a deceptively simple book. The illustrations are so in tune with the words. Bailey is in a new school, his tummy hurts and doesn’t want to get up. Even his faithful and fun-loving dog Fuzzy can’t cheer him up. Life is BLAH! All this changes when a new boy called Tom, comes to school, he is even more nervous than Bailey. Bailey decides to be his friend, so overnight, the world is a wonderful place to be. I loved the way the language relates to the way kids think and talk. It will definitely be a book I’ll share with my grand-daughters, particularly as the older girl is off to school next year, while the younger remains in ‘Kindy’. They have always been inseparable and I suspect some sad days may arise. There are so many aspects of life that Karen has put in this book to discuss with children; facing and coping with change, feeling depressed, being lethargic, feeling alone, scared and not fitting in, then the delight of making new friends and being happy with change. 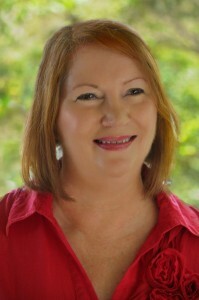 Karen Tyrell, is a passionate Australian author, mental health advocate, teacher, motivational speaker and workshop presenter, seen on TV Today Tonight and heard on ABC radio. Bailey is aligned with Kids Matter, national education curriculum and supported by Kids Help Line. 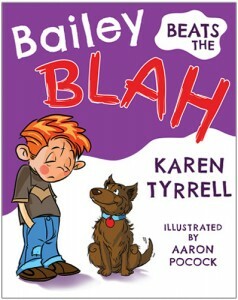 Bailey Beats the Blah is available from Amazon. This is a great second book in an evolving series. Lexi and Al are twins in a modern age who find that their surname ‘Hunter’ is exactly what they are – Word Hunters. 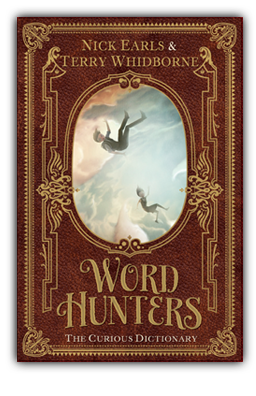 At the end of the first book Al and Lexi set out to find their Grandfather a fellow Word Hunter trapped in a distant past. With each trip back to find a word and peg it they find a clue as to where he could be, they also meet up with some unsavory cloaked characters that are chasing them. Will they ever be safe? They find help in the form of traveler’s who came back in time with them to the present. A librarian turns out to have been keeper of ancient texts in a library 3000 years earlier, and Will a London born Word Hunter who’d also encountered the grey robed nemesis. I loved the historical references that will help kids of the technology age realise things were very different not so long ago, and, in some cases the origins of words from very long ago. Kids of all ages will be intrigued by this journey. 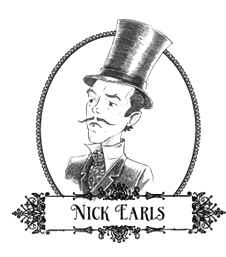 Nick writes with his usual beguiling style and this series really suits his wit. 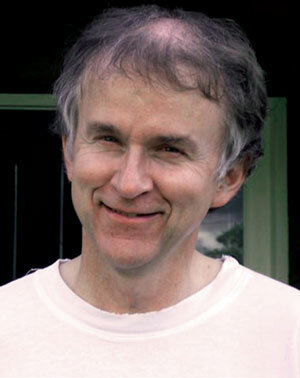 Terry provides the illustrations that are integral part of the story. I’m now looking forward to reading the third book in the series. ‘Word Hunters – The Curious Dictionary’ is a book of discovery that is interwoven with brilliant illustrations that are part of story itself. The beginning is the illustration. The wonder of words and their origins is ignited (literally) in the lives of Lexi and Al, twins of the 21st century internet age. Lexi is a reality TV addicted girl, while Al is a book loving history buff. They don’t realise when they find a very old book in their school library that this ‘The Curious Dictionary’ will lead them to discover that their surname Hunter is what they are destined to become. The first journey has the twins spinning, should they continue to explore words and their origins? Why are they on this journey? Could they be stuck in the past never able to return home? Having solved the puzzle of saying Hello instead of Ahoy, they are whisked back to their own time before having the chance to meet Thomas Edison in his remarkable Lab. They go on to find themselves in mortal danger at the Battle of Hastings but surviving to return to their stayed world. Will they ever be the same again? Lexi hopes she can get back to being just a normal kid while Alex finds the need to save words impossible to ignore. This book really suits Nick’s style of writing and it was so easy to get involved in the children’s journey. I know there are at least two more books in this series and I hope Nick continues to work with Terry to produce these wonderfully constructed tales. Jason Chen lives with his parents who run a fish and chip shop. His father escaped Vietnam as a refugee and came to Australia by boat. Jason is a bit of a loner in a mixed culture and feels like he has trouble fitting in. Mrs Bryant is the weird neighbour; she has a big plastic banana in her yard. Everyone especially Jason’s friends at school, thinks she’s crazy. When Jason stops some young kids throwing stones at the banana, Mrs B invites him in for a drink and biscuit, as a thank you. She asks him to come and help around the yard when he’s able. Little does Jason realize that this is the start of a very big adventure, Mrs B has a secret she eventually shares; the plastic banana is a time machine. At first, Jason thinks going back to early Brisbane is a joke. Quickly he realizes travelling back to the 1860?s, with the Great Fire of Brisbane just days away, is quite an experience. Jason finds the past a very strange place indeed. For a start they have to walk everywhere, no buses or trains. The bush is all about the area that is built up in the present. No telephones or internet. He encounters real bigotry and battles to keep a low profile and speak when he’s spoken to. Mrs B has friends she wants to warn about the impending fire and the disaster it could cause them. 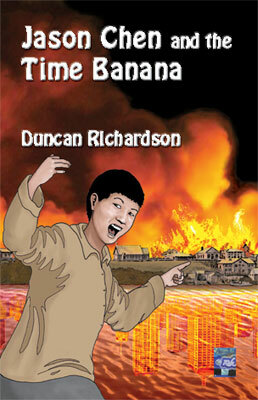 The Chinese community in Brisbane could be blamed for starting the fire and be driven from the growing town. Her friend is a Chinese merchant and she can’t meet him openly, but, Jason can. The plan is set to prevent a change in the history of the future cities past. Jason learns a lot about facing his own fears. He still thinks Mrs B is a bit odd when she assures him that although they are in the 1860’s for many days, they’ll return to the Brisbane present only minutes after leaving. His parents will never know that he played a big part in preventing riots in the burgeoning city. This is a delightful story that gives the children reading it, with their parents, a wonderful sensory experience. The story pages are raised cardboard designs to touch, the information about the native Australian animals fascinating for adults and children alike. All this was born out of a simple request by Betty’s daughter who worked in the Early Childhood sector. She asked for finger puppets with native Australian animals, so that she could help the children increase their vocabulary with more than ‘farm’ animals (cow, horse, sheep) or ‘wild’ animals (lion, elephant, giraffe). The children loved them, so now she needed a story to go with them, naturally Betty obliged. Then her daughter requested she put in into a book. Instead Betty crafted a stunning embroidered quilt depicting ‘Mrs Echidna’s Dilemma’ that won ‘Viewers Choice First Prize’ at the Queensland Quilt Show in 2009. Then the book followed. 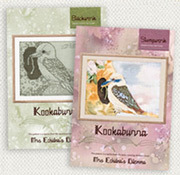 The back of the book provides more for readers with the patterns and description of how to make the finger puppets of Echidna, Possum, Blue-tongued Lizard, Kookaburra, Kangaroo and Joey, Platypus and Galah. I bought this for my grand-daughters and will keep it as a special treat for when they visit. The story I can read to them now as two and three year olds, the information about the animals will be something they explore as they get older. The puppets I plan to make with them when we can all sit and watch the DVD and have some fun with the puppets. This book begins where the last Erasmus ends, with their escape from Kings Paradise. The ballon with Erasmus, his dad, his loyal (and not so loyal) friends, the kids, and babies in jars, lands on the mainland of Uponia. Once the Mayor of Human Cove,the town they land in, decides they are not a threat, they all get fed. So it all turned out well, or did it? They decide to go to the Golden Castle to catch up with Franklin, who is Erasmus’s talking horse surrogate dad, and his family. Little did anyone guess that Dice the evil GRAT Queen, who can read minds, decided to use the balloon technology to send an invading force to Uponia. Soon they disccover, that, once again they are under attack, and not just at Human Cove, where they’d landed, but all over Uponia and the known galaxys inside Erasmus James head. His Dad Zapps a rescue of some of the people, rats, and others who want to leave, back to Earth. Reluctantly he leaves Erasmus behind (who manned up) to take on helping protect those who’d stayed in the castle. The GRAT SIEGE had begun! When everything was very smelly, food was short, the GRATs surrounded the Castle, the King of Uponia King Whizman (Erasmus’s uncle) in hiding, Erasmus is the one they turn to for help. After all Uponia is a universe inside Erasmus head. The blue spot in the book is when his Dad Zapps back into the no mans land between the castle drawbridge and the Grat army. Franklin dashes out to rescue his friend and both are shot with poison darts for their trouble. Franklins daughter Jessie (also a pole crunching warrior like her father) brings both back from an impossible situation. How Erasums ends up going to finally confront and conquer Dice, his own inner demons, is the crux of the story. This is a coming of age story with a difference! Erasmus James is the boy who doomed the universe! 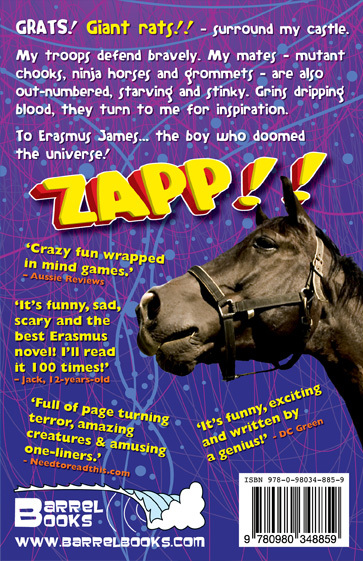 So that’s all three Erasmus James Zapp books reviewed. Enjoy the rest of the blog tour!! These books are the first two in a series by DC Green and are a teenage boy’s adventure that involves facing ones inner demons – literally! Erasmus James is a nerdy kid who is bullied at school and not lacking ego, or mouth to go with it, keeps getting him self into unhappy situations there. His father is a balding, kind hearted guy, to the extent of being an animal hardship softie, filling their home with a menagerie of lame and useless creatures in Erasmus’s opinion. 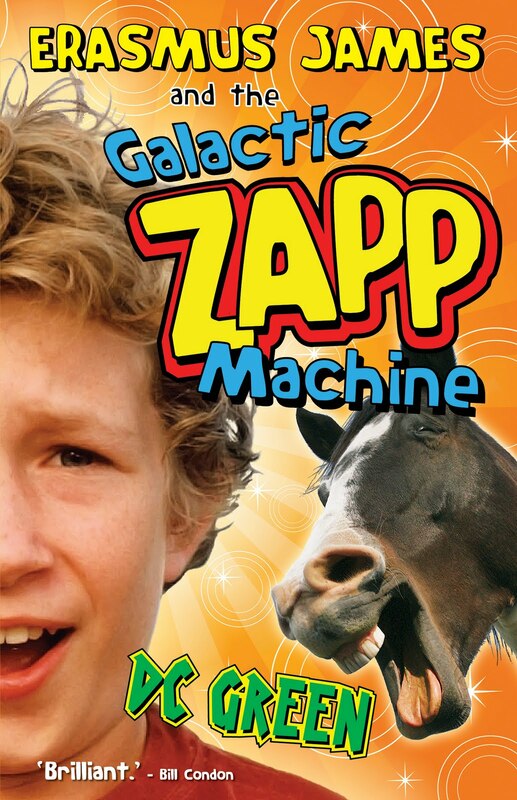 His dad is also an inventor and the ‘Galactic Zapp Machine’ is his latest creation. Naturally, ever inquisitive Erasmus ignores his Dads advice and heads off to worlds unknown on his own. He ends up in Uponia Ruled by King Reginald, where horses talk, chooks have right of way on the roads, and rats are friendly. During a crazy journey across the Uponia to see ‘The Wonder’ Erasmus discovers he is being chased by flesh eating horses. He also finds out that he is the cause of economic disaster, mass suffering and unemployment on the planet because he offered King Reginald, the power crazed king, a wonderful invention; Kars! During all this Erasmus tries valiantly to believe he doesn’t really miss his dad or need to be rescued. This is the true heart of the story. With words of wisdom uttered by the ancient Chicken King Saunders and his dads help, they triumph and escape certain death. is a roller coaster ride, it starts out as fun and becomes plainly over the top. 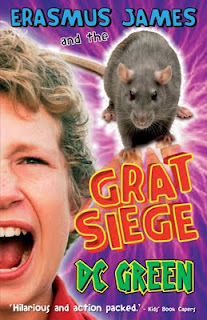 He is driving his subjects crazy and eventually realizes that the rats who are their workers hide a dark secret. Erasmus is determined to free his people from their clutches. Of course, he has to avoid being trampled on by a party of war rats in the process, not to mention being stomped on by his own subjects. These are wacky tales and ‘comic’ in a ‘cosmic’ way! They leave the reader in no doubt that the derelict living in Erasmus James back yard, DC Green, has a warped and quirky imagination. I loved these fast paced books and chortled loudly throughout. 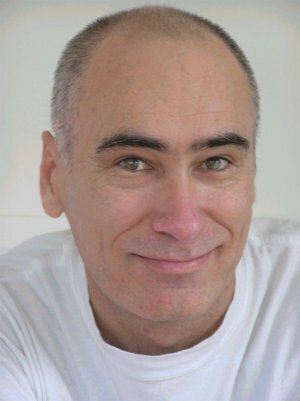 They are available on www.barrelbooks.com with the first book being a free online download. Who is DC Green? 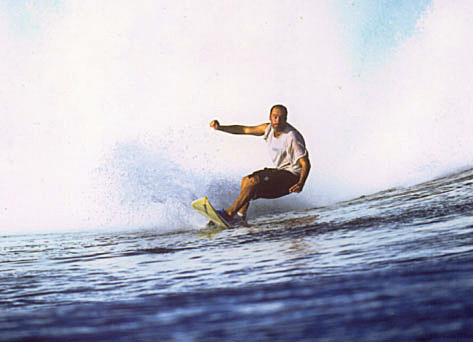 The back page of the book says he is a children’s author, surf journalist and man. 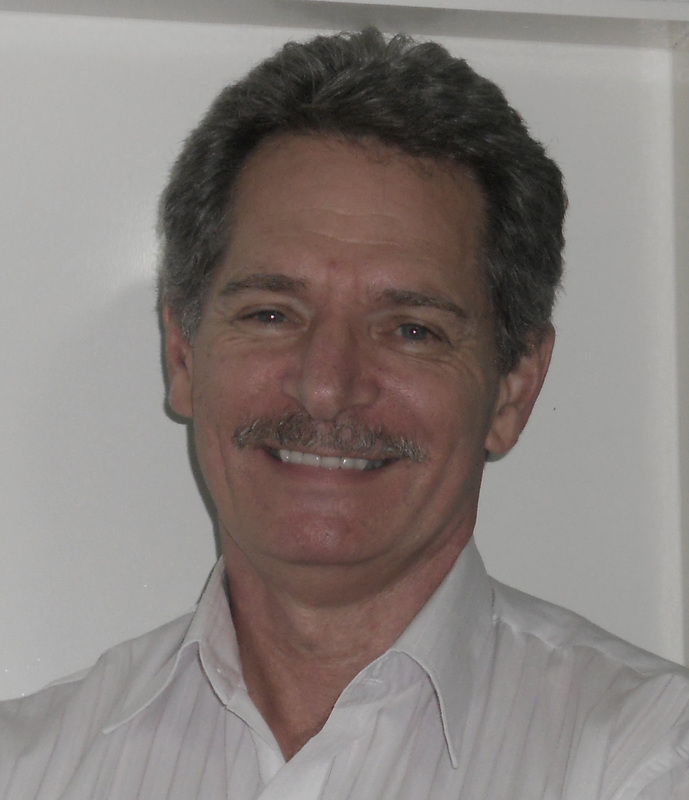 He also speaks regularly about writing in schools and other interested groups. Interestingly the site has Teachers aids to go with the books. Clearly there is a deeper side to our author. These have been on this blog before but good things can return!! 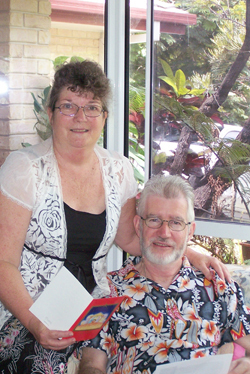 Garney Barnicoat lives with his mother in an ugly grey building, the lift often breaks down. The neighbors complain about him when he thunders down the stairs to try and catch the bus. He is not popular at school, and, the teacher invents new low grades, just for him – ‘G’ (utterly useless) and ‘H’ (very utterly useless). He’s not a normal kid, and just doesn’t fin in – especially since he has lost his dad. Even with a bad start to the day when we first meet him, nothing keeps him down for long. He is coming into his ‘Twelfth’, about to get a share of his inheritance – a country home called ‘Two Rooms’ – and go on holidays. Two Rooms turns out to be a mansion of many rooms, where magic happens to keep the lawns and gardens perfect. His Aunt May drives him there, his other Aunt, Joylene and Uncle Horvest are there too, with their son Eldeth, who is also coming into his ‘Twelfth’. The boys explore the many strange rooms, from the attic to the basement. Strange things happen in almost every room. Some walls are alive, with animals and flora moving around them. Garney and Eldeth find their legacy from the building’s founder, Pepper Barnicoat in the eastern wing at the top of the stairs. The walls are lined with marble tablets that told the story. They met another cousin Morgrieve, who warned them not to search for the treasure. Their interest increased. Undaunted, Garney and Eldeth continued to search. 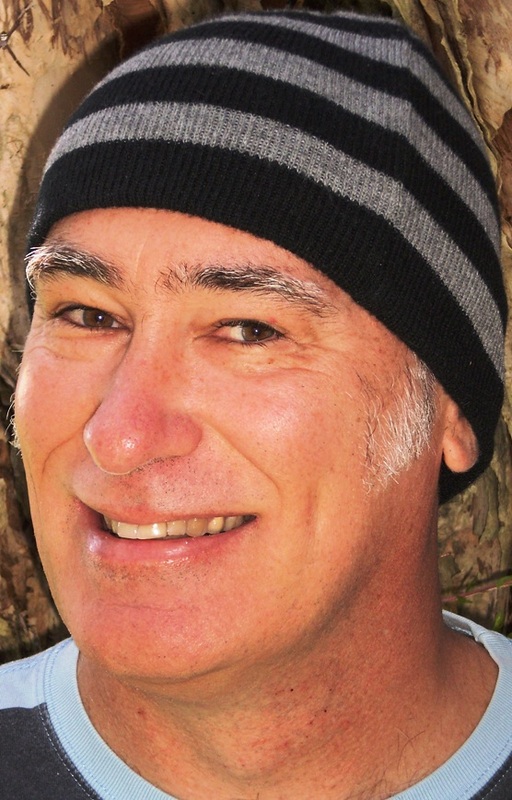 When Eldeth was resting, coping with the pain he always endured, Garney found a secret room. To his surprise, there was a computer on a table that sprang to life when he bumped the table. Yellow letters appeared on an infinite black background: ‘Welcome, Keeper of the Wild Magic,’ it said. 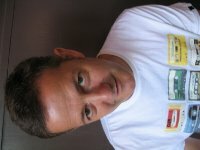 Garney loved computer games and so began to play. That’s when the real journey begins. I simply love the complexity of the Mathemagicians in Yore and how the children in the 4 ½ dimension have so much fun and danger in their lives. Garney and Eldeth enter this world totally unaware that before they can return home, they must learn hyperlogic, mathemagic and how to dazzle a Mystal, all while trying to redeem the Barnicoat name. There were times when reading this book that my heart was racing. I told my husband to forget about action adventure movies and read this book! Clearly this is a must have series to collect. Titian was an orphan and an outsider in the village. Sheep duty terrified her because the Swarthymen might come and steel her or the sheep, to eat. When she looked into the mist, Titian could see the Mystals, when she didn’t look directly at them. She barely had enough to eat. Her friend Myriam, who also worked with her in the kitchen at night, snuck her extra food. All Titian got from the cook, was a clout over the ear. Her only other friend, although he never spoke to her, was Samson, a Clan fighter. She prayed for change, she could not see how this would be possible. 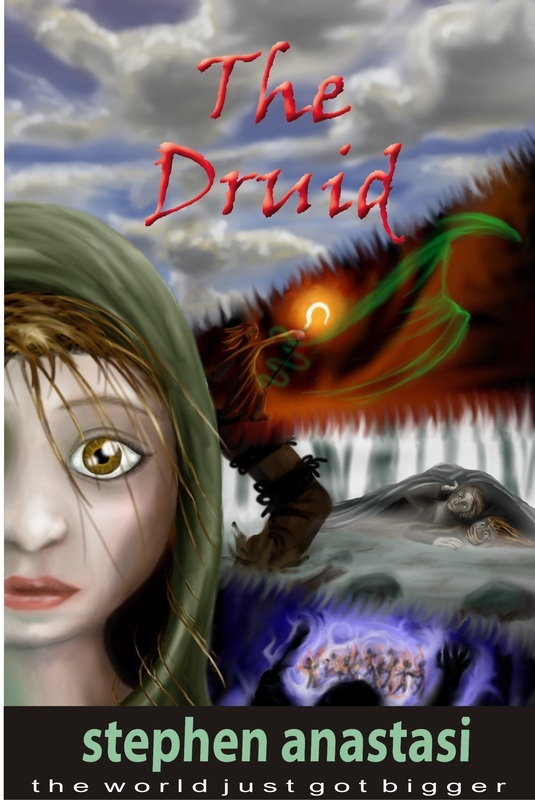 Myriam had taught her a little of the lore of the Druids, as had her mother while she was still alive. Against the rules of her tribe, Titian was carving a Druid staff. When she finished carving her staff, she felt change would come. If the villagers knew she’d made a staff, she would be in big trouble, maybe even cast out from the village. Change came when a stranger, who seemed impressed by her handiwork on the staff, saved her from the Swarthymen. A week later three Druids arrived at Titian’s village. This was a rare event, and the Chief, not willing to raise the ire of the Druids, ordered a feast. When Myriam was badly scalded by boiling soup, the cook made Titian take her place serving the food. When the Druids announced her handicraft to the village, the chief he made it clear Titian would be severely punished. Scared, she ran for her life. From that day, she travelled on in the company of the Druids. Now Titian learned about healing herbs, the lore of the Druids, and the tales of ‘The One’ who would save the tribe using big magic. The Swarthymen attacked, and the Kindred, protected by Samson, Dariad, and his fellow Clan fighters, repelled the enemy in many battles. 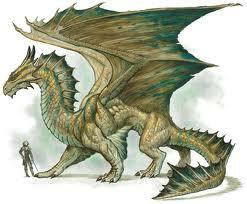 During a battle, Dariad hid Titian while he fought, until the enemy overpowered him. He did not see the Swathymen take Titian away. When Samson and Dariad learned of the betrayal of the Kindred, and Titian’s abduction, the set off in search of the girl, what they find is a great deal more than they bargained for. Titian had tricked her Swarthyman guard and fled into the depths of a cave. What she found there would change the outcome of the battle and the future of the Kindred. I can only say that I loved this book. The whole adventure was a page turner, with the reader drawn into the magic within the tale. I grew up reading Anne McCaffrey and the Dragon series, and quickly found myself immersed in Stephen’s world of Druids, dragons and symbiotic connections, just like my favorite author of all time. I feel sure Stephens work will easily sit alongside Anne McCaffrey’s on my bookshelf. It’s 1864 and Poppy lives at Bird Creek Mission near Echuca. She hates life there, only her brother Gus, living there too, makes it bearable. They are both part aboriginal, their mother died and their father disappeared, leaving them to cope with Mission life. Gus teaches all the kids how to look for bush tucker, he often gets in trouble. One day Gus tells Poppy he plans to leave to look for their father. Poppy is scared for him, but, he promises to return for her before her thirteenth birthday, when she’s old enough to be sent out to work. Not long after Gus leaves, Poppy discovers she is to be put into service much sooner. She decides to go after Gus, and that’s when her adventure really begins. ‘Meet Poppy’, to escape the Mission Poppy dresses as a boy and she heads for the river following her brother’s journey. 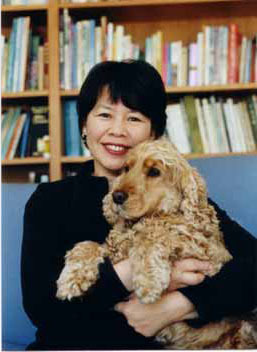 She is makes a friend in a dog she calls ‘Fisher’. Very hungry stumbles across a camp being robbed, then shares a meal with a bush ranger. Finally she stows away on a paddle steamer but still finds herself on the wrong side of the river. 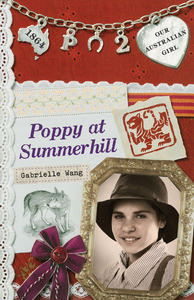 ‘Poppy at Summerhill’, the adventure continues with Poppy getting badly injured, being rescued by an aboriginal roustabout, on the ‘Summerhill’ property, where he takes her to recover. She makes friends of the station owners children. She finds out more about her heritage and investigates her lead to find her Chinese father. ‘Poppy and the Thief’, Poppy leaves the safety and new friendships of Summerhill to continue her search for her brother. She carries a letter, in Chinese, that she needs interpreted, to solve to clues and find her father. She meets up with a boy, Fisher, her dog and travelling companion, shows instant distrust of the boy. Poppy decides she needs company on the road, but, she quickly discovers he is a thief. In the town she hopes to find Gus, she discovers more about her Chinese heritage. 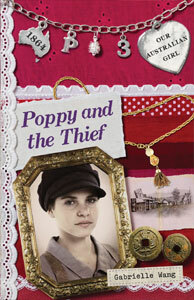 Poppy is accused of being a thief after she followed the boy, who left her with the evidence. ‘Poppy Comes Home’, as she travels on she meets up with a travelling show, agreeing to be part of the act as they go from town to town, getting fed and asking about Gus at every stop along the way. She becomes disheartened when again she can’t find her brother. She discovers the medicinal show is an act and the Professor is a con man, too late, when he tricks her, and takes Fisher away from her. Her faithful dog being her only companion during her flight she feels desperate to find him. When she does find Fisher, she has to trade the one good thing she has found along her journey, to get him back. Then she gets the best news, she finds Gus, and he takes her to their father and their new home. 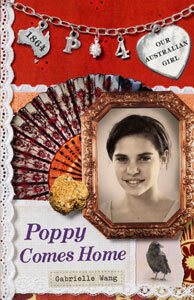 The Poppy books are in ‘Our Australian Girl’ series. These books are an excellent historical fiction aimed at young girls. 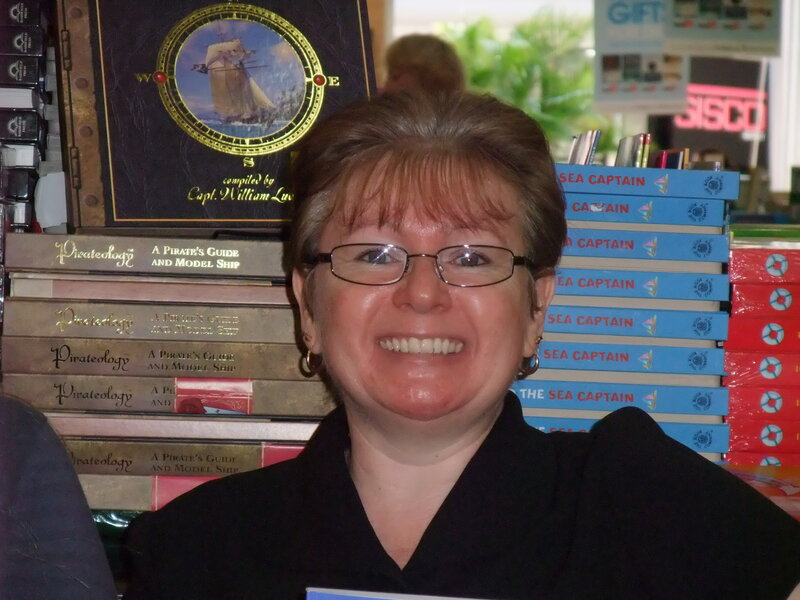 Gabrielle is one of four authors with similar series, giving young readers an insight to life in a bygone era. I bought this book at Sovereign Hill Gift Shop, in Ballarat, where the others in the collection are also sold. Each book has a ‘teaser’, part of the next book?s first chapter to draw the young mind further into the tale. The covers have a picture of Poppy, and a charm bracelet with a different charm beside the book number, along with a map of Australia, where the story is set and information about the era. I loved this series, originally I only bought the first two, but, quickly hooked on the tale had to go and get the other two. 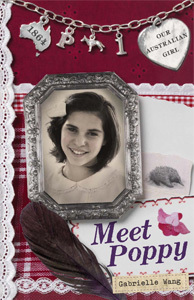 As a marketing opportunity, I believe Gabrielle and the other authors in this ‘Our Australian Girl’ series are winners. Clearly this is a delightful way for a young reader to find out about life in the 1860’s and one that helps them identify with the past. Thanks so much for your awesome review of Bailey Beast the Blah. 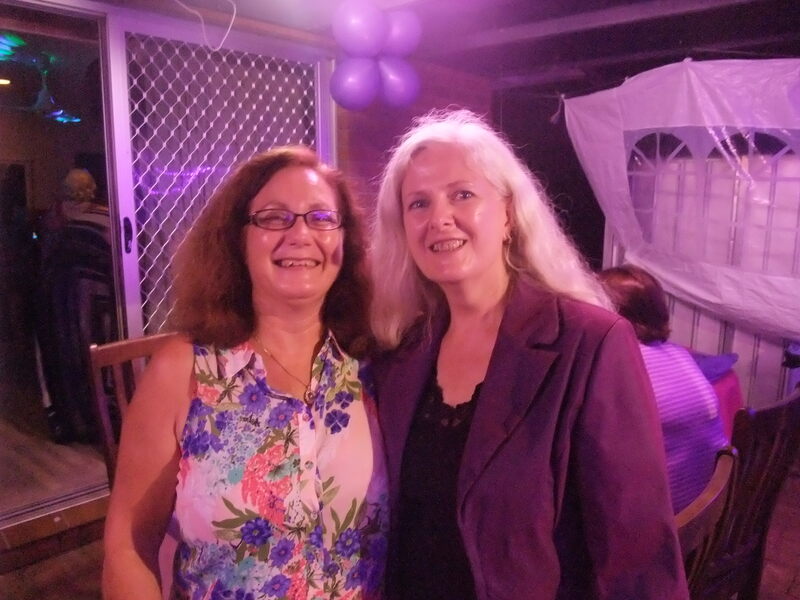 You deserve to be there Karen, and I’m promoting Bailey in a few things happening with Australian Book Reviews if Kelly Anne McLean gets it out there. I did a feature article, blog review and book review for her and am now working on the next one. I’m hoping it will be a monthly newsletter, although she may have many other contributors because it pays! !